Leh, the Mecca of motorcyclists, is undoubtedly one of the most important biking destinations on the bucket lists of most bikers and tourers. The common thread binding them all, however, is that they ride some sort of internal combustion engine-powered machine or the other. While electric vehicles are heavily perceived as machines only for daily runabouts, Okinawa has broken the stereotype and has done what many electric vehicle owners wouldn’t dare think about: reaching one of the highest motorable passes in the world. Two Okinawa Praise electric scooters began their journey from Gurgaon, where the Indian brand’s corporate office is located. Okinawa’s Managing Director Jeetender Sharma, Chairperson Rupali Sharma and all the brand’s pan-India dealers flagged off the journey. 10 days and 1,350km later, the scooters crossed Leh and finally reached Khardung La, surviving an altitude of 18,380 feet! The riders crossed destinations such as Ambala, Jalandhar, Pathankot, Banihal, Ganderbal, Sonamarg, Srinagar, Bhimbat, Lamayuru, before reaching Leh and then Khardung La. The Indian e-scooter maker used removable lithium ion batteries in their scooters to achieve this feat. This arrangement allowed the riders to simply swap the battery & charge the unused one easily at stopovers during the journey. The manufacturer claims a range of 170 - 200km per charge, and the scooters are capable of reaching speeds of 55 - 75kmph under different speed modes (Economy - 35kmph, Sporty - 60kmph, Turbo - 75kmph). It takes 2-2.5 hours for the lithium ion battery to charge completely. While the production model comes only with a lead-acid battery now, the lithium ion variant will be available in dealerships from September-end, this year. 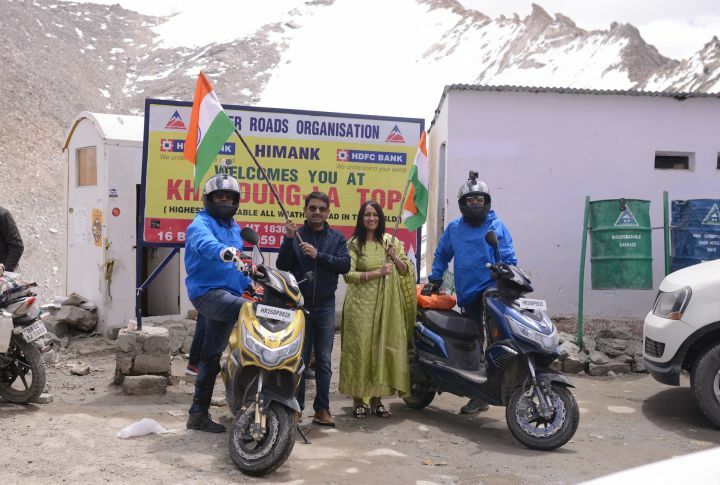 Commenting on the successful ‘Praise De Himalaya’ campaign, Sharma said, “The ‘Praise De Himalaya’ campaign is the first and one-of-its-kind journey of an e-scooter to an extremely high-altitude zone where it is very difficult to attempt two-wheeler expeditions. While many apprehensions were raised on Praise’s ability to complete such a difficult journey, we at Okinawa were confident of our vehicle’s capabilities to complete the trip successfully. It is not every day that an e-vehicle comfortably completes a voyage of 1,350km and reaches a height of 18,380ft. Through the ‘Praise De Himalaya’ campaign, we wanted to ‘Fight for Height ’i.e. the different psychological barriers and biases that stop a consumer from opting for an e-vehicle. We sincerely believe that Praise’s unique achievement will bring forth a transformation in the way that e-vehicles are viewed in the country." The achievement goes to prove that electric vehicles can be as capable as their petrol-powered counterparts. The Praise costs Rs 59,889 (ex-showroom, Delhi), and competes with the Twenty Two Motors Flow and the recently-launched Ather 340 and Ather 450. You can read a spec comparo of these three scooters here.